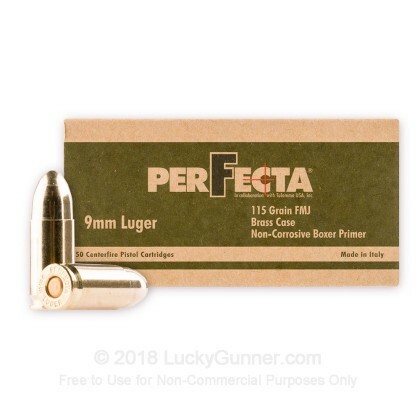 These 9mm Luger rounds from Fiocchi's Perfecta brand are a dependable choice for range training, practice drills, and local level match use. 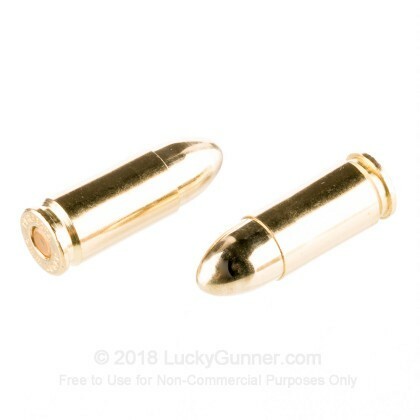 Each cartridge is built using a reloadable brass casing fitted with a non-corrosive Boxer primer which expels zero mercury or caustic materials that might cause undue wear to a handgun's bore or moving parts. The case is filled with clean-burning, extruded propellant and capped off with a 115-grain full metal jacket (FMJ) projectile. The FMJ bullet has a rounded nose and curved ogive which provide seamless feeding even with older styles of pistols. The lightweight load exhibits pleasant recoil as well as a flat trajectory that novice and expert shooters will both appreciate. Fiocchi is an Italian company with component manufacturing experience dating back to 1876. The Perfecta line is backed by their world-class innovation and economically packaged to pass cost savings to the consumer. Good, clean & reliable ammo. 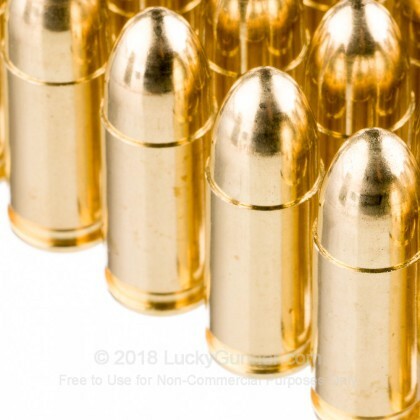 This ammo is best bang for your buck. Its a little on the hot side - in the +P range @ 1247 fps as advertised. But from my test its average is 1130 to 1180 fps. Very acceptable - quality, performance & value. I shoot competitions regularly with this ammo in my pcc. I have not had a single failure accountable to the ammo from day one. I recommend this ammo for all types of shooting, from plinking to major competition. First case of purchasing this ammo after reading other reviews. I agree, it's probably one of the cleanest ammo that I have purchased. Just 250 rounds and no issues what so ever. Shoots very straight and very clean. With the price a little cheaper than my normal PMC 9mm, this might be my new go to ammo. I have read in previous reviews that this is extremely clean, accurate ammo. I ordered some because I wanted to see for myself. They are all correct! This is very clean ammo and extremely accurate. I use it in my Ruger LC9s, and usually clean my gun after every range shoot (200 - 300 rounds). The last couple of times using this ammo, I disassembled my firearm and it did not even look at all dirty (I still cleaned it), however, it looked like it did not really need it. I have tried many different brands of 9mm, and I have to say this is my go to ammo from now on. I am very Impressed. This ammo was relatively cheap and performed well. Trying Magtech next as it is cheaper than this one. Fired 1,000 rounds of this ammo. Works great! Thanks LG as always. Can buy with confidence!! Great ammo, with a great price and fantastic delivery from Lucky Gunner! I shoot Ruger's LCR revolver, and ruger LC9s...been using Perfecta for a year or so with absolutely NO problems. It's a clean shooting no jams ammo. Walmart was my prior go-to 'supplier'. Lucy for me I found Lucky Gunner website...great price, very fast deliver, and a very informational and helpful website. Super fast shipping. I ordered on Monday had it by Thursday. Great price, can't beat 1000 rounds for under 200 bucks. Best website for ammo hands down. I've fired about 750 rds of 1000, no failures or malfunctions of any type. This ammo is accurate. I've used it in my Sig 320, CZ P 07, CZ P 10C, ReX zero 1 and Canik 55 Stingray C.
I have been shooting competitively for three decades and have seen a lot of ammo manufacturers come and go. Was very happy to find the Perfecta 9mm. So far this year I have fired 6,300 rounds of it and can tell you it is clean, accurate and reliable. It is now my go-to target ammo for as long as it is available. I put a 1000 rounds through my p226 and p320x5 and let me tell you this is all I will order from now on. I was using Remington 115gr and Winchester's 124 white box but this ammo is far more accurate and super clean. 1,000 rounds put through the combination of my Glock 43 and Walther PPQ M2 without a single issue. Very little residue to clean up. LG service has been nothing less than outstanding. Shoots very clean and consistent. This is the best 9mm I have run through both my G19 and VP9. Shoots very clean and consistent. Great buy for the price point. I will certainly buy more. 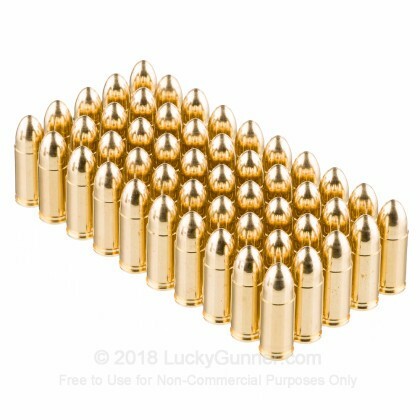 I purchased 1000 rds of this ammo from Lucky Gunner and it is fantastic! Have ran it through my Browning Hi Power and my Chiappa M1-9 without a single jam, failure to feed, or misfire. This is now my go-to ammo, and Lucky Gunner is the best place to get it! I had never tried this brand before but am so glad I did. I put 100 rounds through yesterday and no misfires. Good price. Good rounds. The only reason why I didn't give this ammunition a perfect 5 star rating is due to the fact that I had 3 failure to fires, but that was out of 5,000 + rounds so all in all it's still really good ammunition for the price point. It's VERY clean ammunition. I highly recommend Pefecta and if you're on the fence about it, just commit and buy it, you won't be disappointed. You can check out my Instagram page to see this ammo be run in all my videos through various pistols. Walmart never has enough of this ammo. Now I'll never run out! I put about 500 rds thru my M&P shield at an indoor range - nothing smokey, just great performance. No misfire, hangfires ,etc. The price isn't the cheapest but it is exceptionally priced for its quality. Inexpensive ammo, very reliable, never had any malfunctions or problems, have not had any issues with it being dirty as some have indicated. Best deal out there in quality 9mm FMJ! 29 years shooting and this is the best brass cased FMJ I have ever used. Will be ordering a few more cases soon. New to ordering ammo online and came across this site. Usually I would go up to Walmart and pick up either Perfecta or Winchester but, I am hearing rumors Walmart stopped carrying Perfecta. Anyway, Shipping was fast. Ordered and Received it in 2 days. Went out to WV with some co-workers for the weekend and shot off 500rounds in my HK VP9 without any problems / issues and it really doesn't get your firearm that dirty. Highly recommend ordering it. OK at the range, not sure about personal defence. Shoots well in my Ruger LC9s. Not as dirty as some have said. My only concern about self defense is penetration. Certainly don't want to be responsible for maiming or, worse yet, killing someone I'm intending to hit. This bullet easily penetrates a person's body & more! I have shot a couple of thousand rounds of Perfecta. It's solid stuff. Never ever experienced any dirty smoke issues and I always shoot indoors. Will buy it when I find it. have shot a couple hundred in my g19 burn clean very accuracy love it. i will buy it again thanks lucky gunner. I'm an active duty service member, and I practically live at my local range. I have never had any issues (no FTE or FTF) from this brand. It is very clean, reliable, and accurate. The only people who've had any issues with it being "dirty" are the morons who drench their handguns in oil....the "smoke" they complain of is your gun burning that extra oil.. I clean and service my pistols every month, never had any issues with any of my multiple firearms. Enough said. I didn't buy it previously from Lucky Gunner (I will now!) but I've shot quite a bit of this ammo. In my experience, it is clean and reliable ammo that performs exceptionally consistent for a budget brand ammunition. It is made by Fiocchi. I've used it in 9mm and .45 ACP with great luck in every gun I've used it in, including; Walther PPX, Springfield Armory XD9 and XDs, a Colt Commander 1911, H&K USP Compact .40, and a Sig Sauer P320. 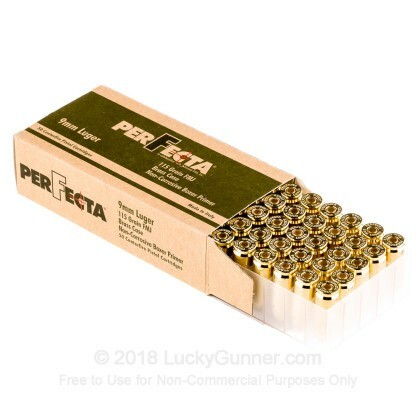 I will continue to use Perfecta ammunition for target practice unless the quality drops. ventilation because there was way too much smoke after firing 3/4 of the box. even the Range Officer commented on how dirty it was. the ammo was used in my Sigs that were cleaned before going to the range. I tried "Lawman 124gr TMJ Clean Fire"," Magtech 115gr CF" as well & they were great. Buy some of the aforementioned ammo & have a fun day at the range. My family uses this in our Glocks. It hits where you aim if you do everything else right. Great price for great ammo. I buy for 4 shooters. We all think this is great ammo for a great price. Great shipping time. Thanks Lucky Gunner. This has been my preferred range ammo. Over the past year I've used about 1,500 rds in my FNH FNS-9 & Sig P938. The cleanest ammo I've used, accurate, no issues whatsoever. i love this stuff clean burning very accurate never fail to feed . Both my Walthers love this Stuff. I've shot many thousands of rounds of this ammunition in IDPA and it has never, ever let me down. It is my "go to" ammunition for training/competition. This ammo rocks. I like the way my CZ chews this stuff up. Never had a FTE or FTF and buy it whenever I can! 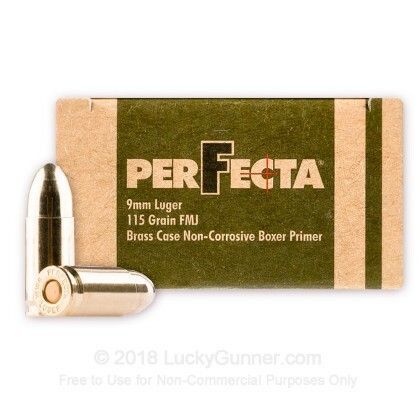 Q: Will you be getting anymore 115 grain perfect ammo 9mm? A: Hi John. That Perfecto is a very popular product. Great cost and a super value from Fiocchi! We do have it on order. Hopefully it will come in soon. Since we never backorder and only list what we have ready to ship the day you order, keep an eye on the website. It will be here soon we hope. Q: Can I use this bullet in an indoor range? A: Hello Sylvester, yes this is a brass cased, non magnetic ammo and can be used at an indoor range. Q: What is the energy and FPS. On these? A: Hi Chase, This information is not yet available from the manufacturer. Once it is available, we will be sure to include it on the product page. Q: 9mm - 115 Grain FMJ - Fiocchi Perfecta - 1000 Rounds I know the shell is brass, what is the head made out of? My range will NOT allow steel. A: Great question! The 9mm Fiocchi Perfecta 115 gr FMJ are manufactured with copper-jacketed lead projectiles. This ammunition does not contain steel. Q: Are your bullets made of any steel or magnetic metals? I'm shooting at a range that requires no steel ammunition, and they will check with a magnet to verify it. A: Hello Kevin, Perfecta ammunition is loaded with a copper jacketed, lead core projectile and does not contain any steel.